The period of peace which followed the installation of government under a podestà did not last long. As early as 1216 the antagonism between the consorterie of the Buondelmonte and the Amidei served as a pretext for a renewal of the struggles within the ruling group and for the beginning of feuds which were to afflict Florentine society for the entire century, dividing the citizens between Guelphs and Ghibellines. In 1244 the Ghibelline nobles, who were in power, decided to broaden the social base of the government, so as to obtain the favor of the merchant middle class. This was the prelude to the beginning of the period that was to be known as "Primo Popolo". The Podestà was flanked by two "Captains", representatives of the "People", that is of the organizations of commerce and the artisans. But only a few years later (1250) the merchants and the artisans as a whole, "radunandosi insieme a romore", managed to usurp the power of the Ghibelline nobles and initiate a new political policy. The "Popolo" was juxtaposed to the other municipal institutions. The new organization was of a military character: twenty companies based on a topographical distribution each had their own banner, gonfalonier and Council. The "Capitano del Popolo" was set at its head. To ensure his impartiality he was to be a foreigner and he was flanked by a Council of ancients and a Council of the representatives of the Guilds. The Societas militum were abolished, in the hopes of allaying the arrogance of the nobles and of preventing them from returning to power. So all the towers had to be cut down to a height of 50 braccia (29 meters), "... since (the city) had a great quantity 120 braccia high". This was the beginning of another period of peace and prosperity and the city's economic and financial power was affirmed. Outstanding evidence of this economic expansion was the coining in 1252 of the gold florin, which joined the silver florin coined as early as 1235. Symbol of the city (it was not by chance that the coin represented St. John the Baptist on one side and the Florentine lily on the other), the gold florin testified to the existence in 13th-century Florence of a flow of precious metal, furnished by commerce, which by this time was on a continental scale, and credit, which was to make the city the financial capital of the West. During the period of the "Primo Popolo" the population of the city grew and new public buildings went up. In 1255 construction began on what was to be called the Palazzo del Popolo.The district of the Oltrarno was also furnished with stronger fortifications, utilizing for the scope material from the numerous towers which had been lopped off, and a fourth bridge, Santa Trinita, was built as already mentioned. The Palazzo del Popolo (now the Bargello) was erected to house the Councils of the Commune. With its imposing mass and its crenellated tower rising above all other city towers, it was the expression in architecture of the new political policy. The present aspect of the palace is the result of the integrations and additions of 1340-1345. Severe and suggestive, the unified massive block is lightly marked by the delicate cornice moldings which divide it into three stories, the second of which is softened by a succession of one and twolight openings. The ill-omened day of the battle of Montaperti (1260) with the painful defeat of the Florentines by the Sienese hosts, determined the obliteration of all that the merchant middle class had accomplished politically. When the Ghibellines resumed power and restored the old institutions they decreed the destruction of the palaces and towers and houses which the principal exponents of the Guelph party owned in the city and in the surroundings. A valuable document of 1269, the Liber Extimationum, or Book of the damage done, tells us just how great the destruction inflicted by the Ghibelline party was. The city was covered with rubble, and 103 palaces, 580 houses and 85 towers were totally demolished not to speak of the partial damage done to other buildings. But despite this, incredible as it may seem, the economic development of the city does not seem to have suffered from all the damage inflicted on the architectural patrimony. For six years Florence was forced to submit to the outrages of the great Ghibellines. It would have been destroyed had it not been for the fearless defense of Farinata degli Uberti at the convention of Empoli. But on the death of Manfredi (Feb. 26, 1266), the middle classes, defeated but not conquered, attempted to take over the government. The attempt failed, but the Ghibellines, fearing the power of the people, and deprived of imperial support, were forced to accept the services of Clement IV as peacemaker between the opposing factions. The pope openly favored the Guelph faction which thus succeeded in reconquering the power, with the aid of the knights of Charles of Anjou whose Italian expedition was financed by money from the Florentine bankers. Masters of the city, the Guelphs named Charles podestà for six years and reintroduced the political institutions abrogated by the Ghibellines. In the meanwhile, notwithstanding a series of attempts (all of which failed) to make peace between the two factions, two new parties began to shape up among the people at large: the "Magnati" or entrepeneurs (persons whose aims were deemed dangerous to the populace as a whole, in other words the noble Guelphs and the repatriated Ghibellines, mostly large holders of houses and lands) and the "Popolani" or workers (merchant and artisans organized in guilds and in turn divided into "grassi" and "minuti" depending on the extent of their interests). Between 1282 and 1283 the Arti Maggiori, corresponding to the bourgeois business class, managed to introduce their own organs and institutions into the government. This was the beginning of the regime known as "Secondo Popolo" which was to lead to the constitution of the "Priorato" an institution which with all its ups and down was to represent the supremacy of the Guilds for almost two centuries. The new representatives of the Commune from then on were called "Priori delle Arti" (or later "Signori"). There were six of them, one for each civic quarter, with a "Difensore delle Arti e degli Artigiani, Capitano e Conservatore della pace del Comune di Firenze" at its head. The Magnati were not initially excluded from the government but in order to participate were obliged to join one of the Guilds. Later (1293), with the famous "Ordinamento di Giustizia" promoted by Giano della Bella, the historical process begun in the 12th century was to reach its natural conclusion - the Magnati were prohibited from taking part in the political life of the city. 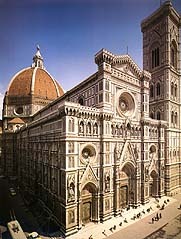 In the latter part of the 13th century Florence reached the zenith of its economic and demographic development. This was the period when great things were done in the fields of architecture and town planning, made possible by the formidable accumulations of capital that resulted from the expanding commercial and financial activities. The towered city, enclosed within a wall, was being replaced by an urban structure composed of a city "spread out in an equilibrium of open and built-up spaces" where "the urban landscape dominated by the recurring towers of the powerful private families was replaced by a landscape organized around large public structures" (G. Fanelli). The population which had continued to increase (according to Fiumi's figures there must have been more than 90,000 inhabitants) spread beyond the walls of 1172 creating new suburbs (borghi). New city walls were needed and in 1282 a belt 8,500 meters long was planned, with 73 tall towers and 15 gates equipped with their own towers, enclosing an area of 430 hectares, five times that of the precedent urban area. The size of the project based on an anticipated further expansion of the city (which was not to be), made it possible to include many fields and building areas together with the suburbs. The new city walls were planned so as to include within their circuit the extensions of the roads which departed from the gates of the precedent city wall. This explains the inclusion of the hills corresponding to Boboli and Costa San Giorgio. The Mugnone was naturally deviated once more and its waters, as before, filled the moats along the walls. These sixth (and last) city walls were the greatest financial commitment ever undertaken by the Florentine Commune. This was why work went on so slowly, interrupted more than once because of war and not finished until 1333. 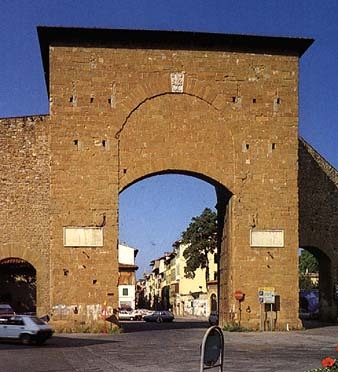 Much of the wall was demolished in the 19th century and only a few tracts, Oltrarno, and the principal gates, of which only one Porta San Niccolò) has preserved its original height, are still extant. The ground plan of the walls however is still to be seen in the line of the avenues that run around the city periphery and for whose building they were demolished. At the end of the 13th century Florence could rightly consider itself the main city of the West, as cited in the commemorative tablet of the construction of the church of Santi Simone e Giuda "... de florentina (civitate) pre qualibet urbe latina..". The entrepreneurs then in power decided to construct two great buildings which were in a sense to be symbols of the wealth and power of the city: the new cathedral and Palazzo della Signoria. Arnolfo di Cambio was the outstanding figure who designed both buildings, as well as all the other important works promoted by the government of the Guilds, including the new walls. The imposing palace-fortress for the residence of the Priors was begun in 1294 and its mass loomed over all other buildings in the city. Visualized as a great square block, topped by a projecting crenellated gallery, the building is characterized by the vigorous thrust of the high tower which surmounts it and which echoes threedimensionally the terminating motif of the palazzo. The facing of rusticated ashlar in pietraforte accentuates its character of "keep and martial pride" and it is divided into three stories by cornice moldings on which the two-light windows circumscribed by round-headed arches rest. In 1296 the reconstruction of the old cathedral of Santa Reparata was begun, a church which had become "... very coarse in its shape and small in comparison to a city of this kind". (G. Villani). 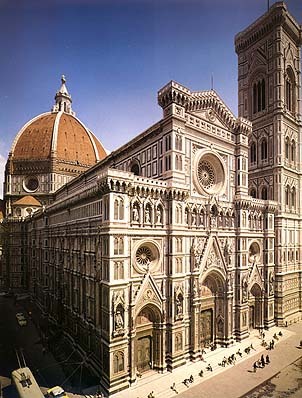 The new building, no longer dedicated to the Palestinian saint, but to the Madonna, or more precisely Santa Maria del Fiore, was to undergo various changes in size and plan in the course of its construction which lasted for almost a century. Arnolfo's bold project was however basically maintained.The longitudinal scheme of a nave and two aisles was grafted onto a central plan building which fused the transept and the presbytery into a single organism and resulted in three tribunes in a trilobate arrangement around an enormous octagonal dome. The interior of the building is characterized by its great sense of space which dilates in all directions from the wide nave with its ogee cross vaulting springing from powerful composite piers (multipli et uni) connected to all the imposts of the arches. The construction of the great Franciscan church of Santa Croce is also attributed to Arnolfo di Cambio, as previously mentioned. Together with the Dominican Santa Maria Novella it represents another of the most prestigious monuments erected at the end of the 13th century under the government of the "Secondo Popolo". When the city and the countryside were organized into districts (1292) and the building of the new city walls was begun, a whole new series of urban measures were undertaken with a view to opening new streets and widening or adapting the ones that were already there, so as to confer order, regularity, and decorum on the urban fabric which in the meanwhile was being enriched with new types of residential buildings. The numerous towerhouses (all of which have now been lopped off) were flanked by the palaces which the middle class merchants were building as a symbol and visible sign of their wealth and power. In the course of the 13th century, as we have seen, the tower-houses gradually modified their characteristics, with a greater number of openings that corresponded to the various rooms and, at times, an occasional decorative element (witness the Amidei tower with its two protruding lion protoma). The new 13th century type of tower-dwelling can be characterized by the fine torre degli Alberti in the Via dei Benci, the torre dei Cerchi in the street of the same name, the torre dei Corbuzzi in the Piazza San Pier Maggiore, the torre dei Marsili, in the Borgo san Jacopo, the torre dei Foresi, in the Via Porta Rossa the torre dei Donati, in the Borgo degli Albizi, to mention only a few of the better preserved ones. But the new residences which the rich businessmen built from the late 13th century on were the fruit of a profound transformation of civil architecture which replaced the tower houses with buildings in which the rooms were prevalently distributed horizontally, with the volumes relatively articulated and spread out and resulting in a greater complexity of layout.The massive cubes of the palaces with their regular facing of rusticated pietra forte were pierced by more and more openings, signs of a new, freer and less schematic concept of the organization and construction of space. 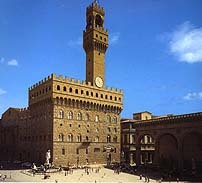 The large Palazzo Mozzi, which dates to between 1260 and 1273, is one of the most conspicuous examples of the palaces that were built in this period. For decades it was considered the noblest civic building and it was not unusual for important personages in visit to the city to be lodged there. Palazzo Ruggerini, later Gianfigliazzi, between the Piazza Santa Trinita and the Santa Trinita bridge, is also of note, as well as the complex of buildings the Peruzzi erected around 1283 on the ruins of the Parlascio (the name the Florentines gave to the remains of the Roman amphitheater, a corruption of the Greek perielaison meaning circular space). Many other palaces of the late 13th century were later remodelled and now traces are still to be found in various architectural elements, (doors, windows, fragments of walls in sandstone blocks) in the buildings that line some of the oldest city streets such as Borgo San Jacopo, Borgo degli Albizi, Borgo Santi Apostoli, Via del Corso, Via Condotta, Via dei Cimatori, Via delle Terme, etc.